We have reached the halfway point of the summer! It is hard to believe that three weeks have come and gone and that there are only three weeks left! We are all having so much fun that the time is flying by! Today, we enjoyed another beautiful, sunny day at the pool! 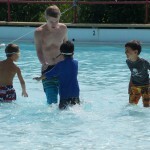 The campers continued to show off their fish-like swimming abilities in the pool! There were lots of big smiles on little faces as they gave their counselors a little splash of cold water before everyone was fully used to the water. 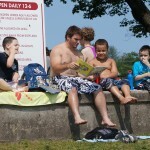 It is nice to take a little break from swimming for a book and a snack! Tag in the pool is a fan favorite! Next week’s theme is Music which will involve singing, dancing, and playing different instruments. We will also be having some special presentations that will add some extra excitement to the week! The field trip next week is to the movie theater in Bellingham to see Disney’s Planes: Fire & Rescue. Please send in this PERMISSION SLIP.